They are pretty surreal environments. The absence of people helps you understand the scale of the places, even if they’re not fully built out. You can see the markings of the roadways or the block structures sort of stretching out into the distance, and you recognize how big these things were intended to be, and that sort of scale makes it more obvious how irrational they were in their undertaking. 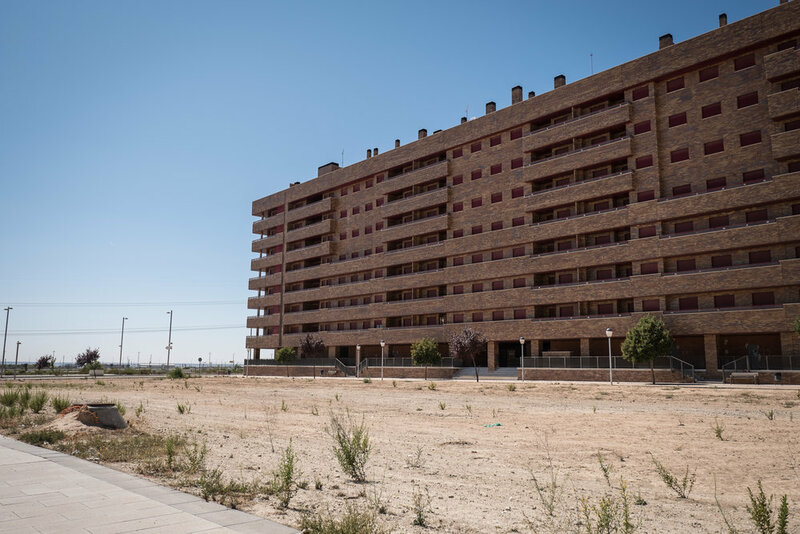 In the span of just twenty-three years, from 1985 to 2008, Spain experienced three intense building booms and busts, meaning that oversized development projects dot the country's landscape and pop up in unexpected places. 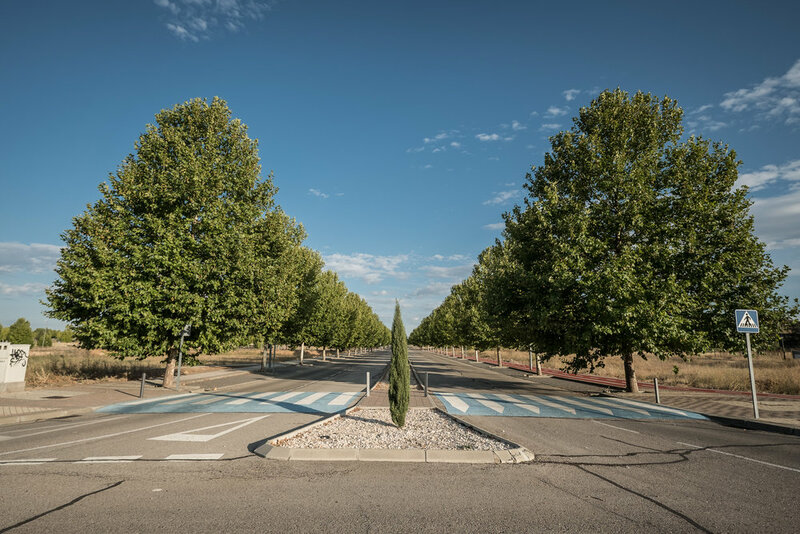 Landscape architect Christopher Marcinkoski describes this phenomenon as “speculative urbanization," or what happens when public and private groups embark on large development projects for an economic boost rather than actual need. 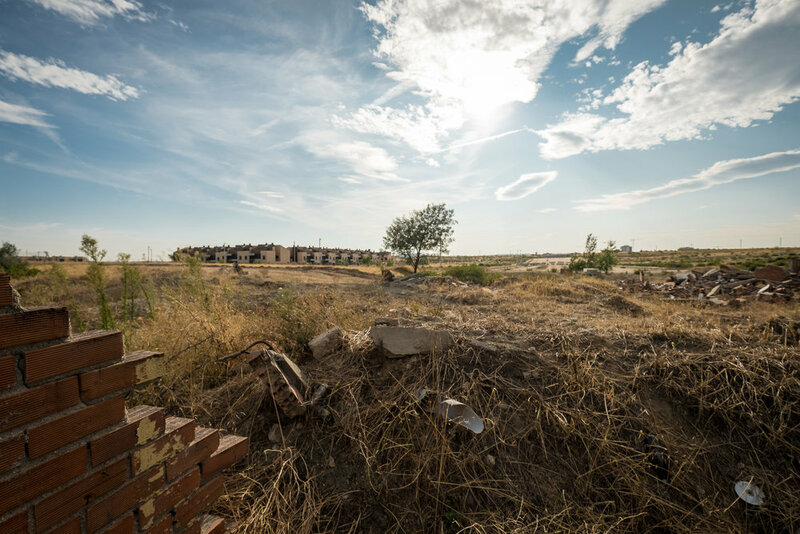 Speculative urbanization spread across Spain like wildfire during the last property bubble in the 2000s, and as an urban planner in Spain for the summer, I couldn't help but explore some of the country's notorious ghost towns and airports. Many of these pricey and dubiously-planned developments continue to struggle to gain traction while a few never took off, so here is an update from the field. 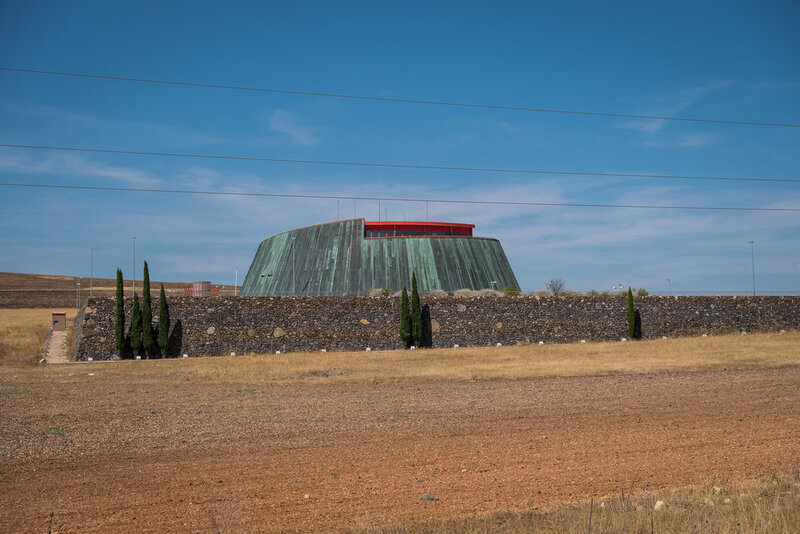 Right off the highway is this sprawling development, so low and red that it practically blends into Spain's rugged countryside. 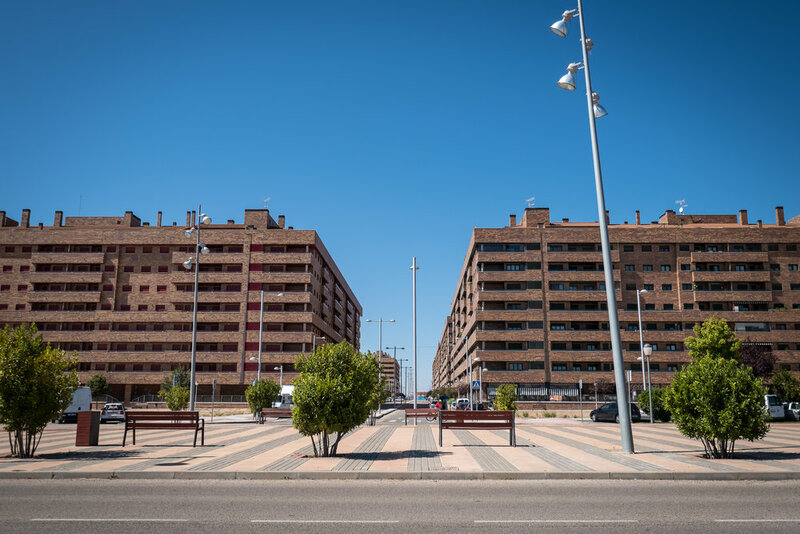 Since its conception in the height of Spain's mid-2000s building boom, Seseña was doomed. First, developer Francisco Hernando bribed local officials to approve this massive project, one of the country's largest and most expensive developments ever. Then, infrastructure for water and gas was not included in the plans (really?? 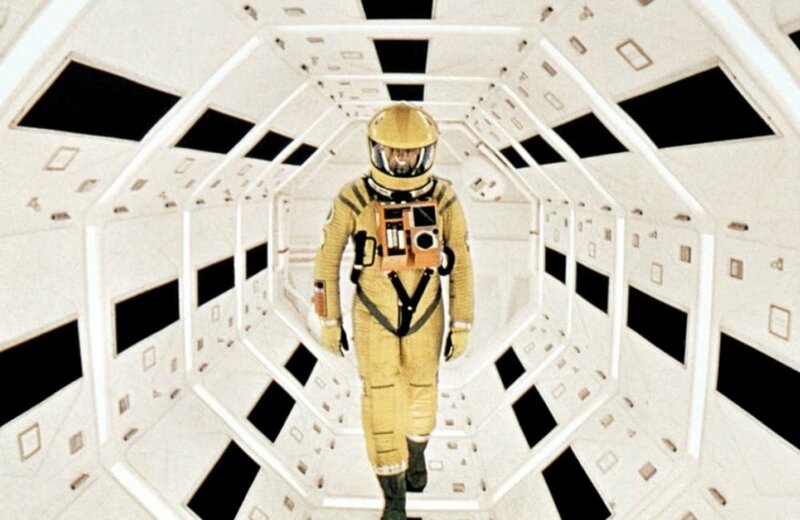 ), rendering the completed units uninhabitable. Finally, scant consumer demand and project financing left behind large swaths of empty land chopped up by roads and sidewalks leading nowhere. When I visited one Saturday, I was surprised to see the odd community quietly buzzing with life: couples walking their dogs, children running along wide promenades, people heading to the surprisingly lush Parque de María Audena. 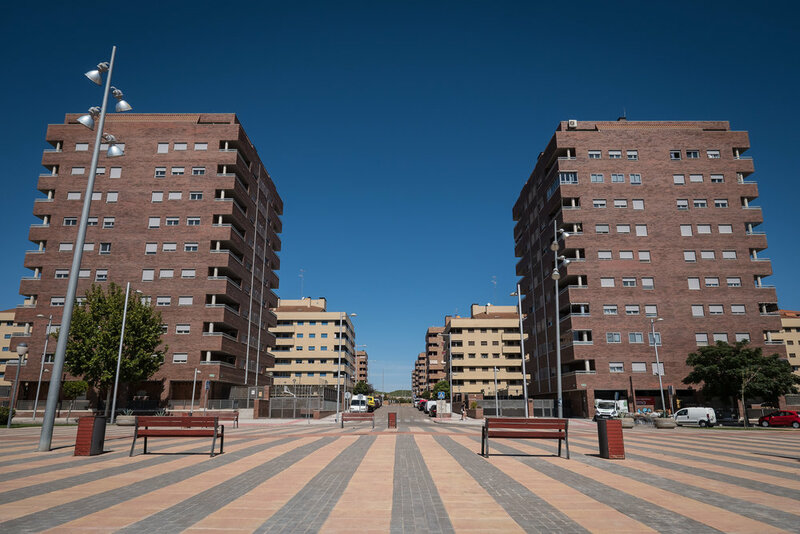 Life didn't look too bad in Seseña, and things are improving since the development's name became internationally synonymous in 2012 with "Spanish housing bubble ghost town". Yes, I thought the architecture was painfully dull and there was little to do or see, not to mention public transit could use a huge boost (no train station? 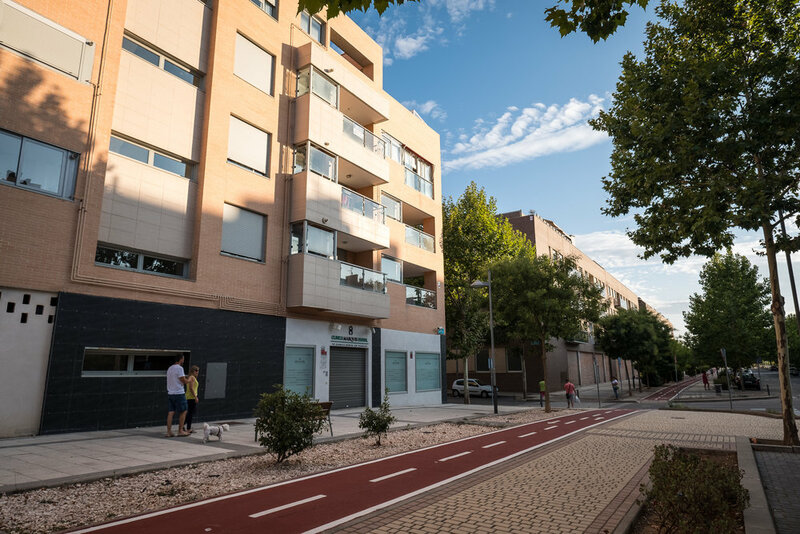 ), but overall the community is attractive and the apartments are affordable, making it perfect for the thousand or so young families who call Seseña home. 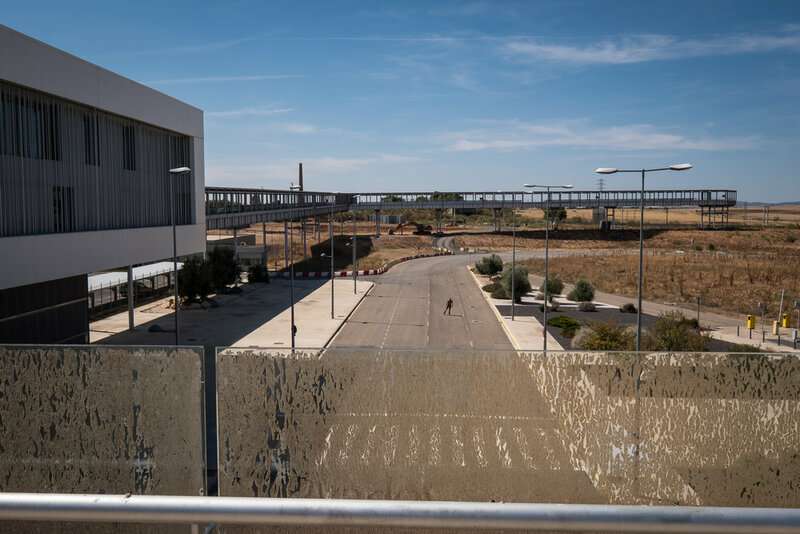 A project that began at the peak of Spain's housing boom in 2006, only 3,000 people live in this ambitious suburban development intended for 30,000 residents. 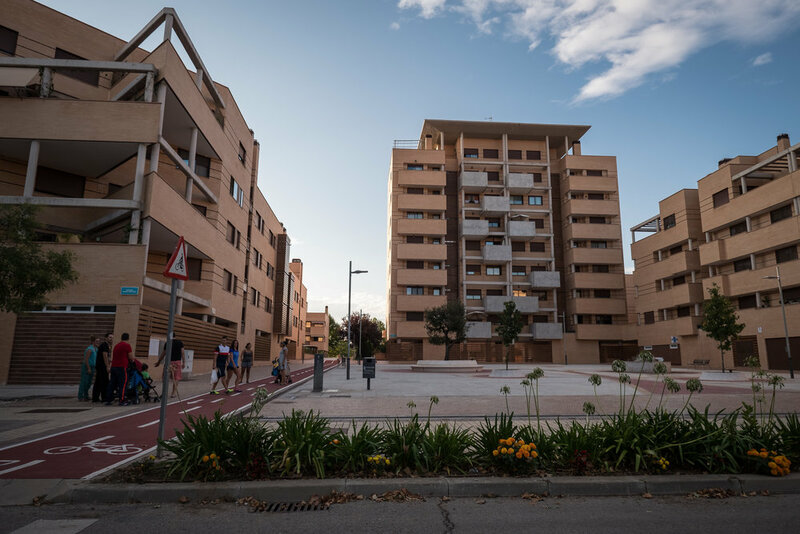 Ciudad Valdeluz was similar to Seseña with its half-finished assortment of empty streets and lots, but with less offensive architecture and much more amenities. I visited the community on a Sunday evening and was pleasantly surprised by the town's beautiful landscaping and abundance of wide sidewalks and bike lanes. 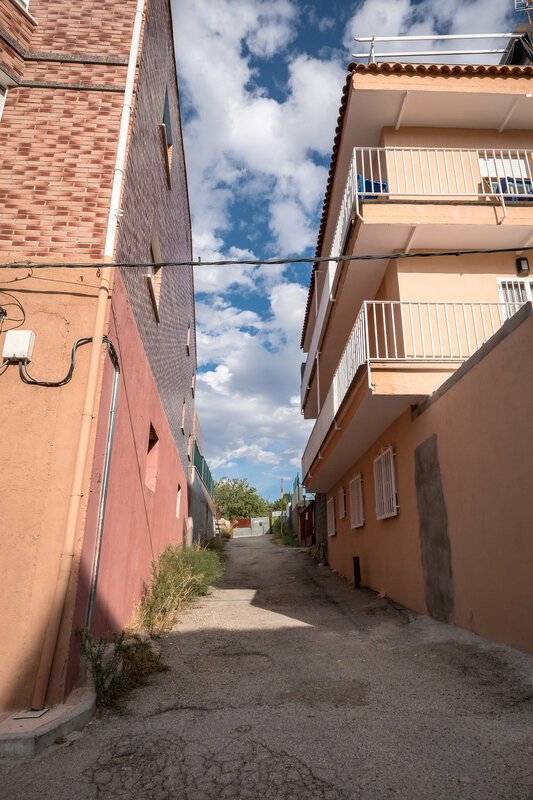 I can understand why this town's population of young families call sleepy Ciudad Valdeluz home, because it felt connected (thanks, high speed rail station) and welcoming. 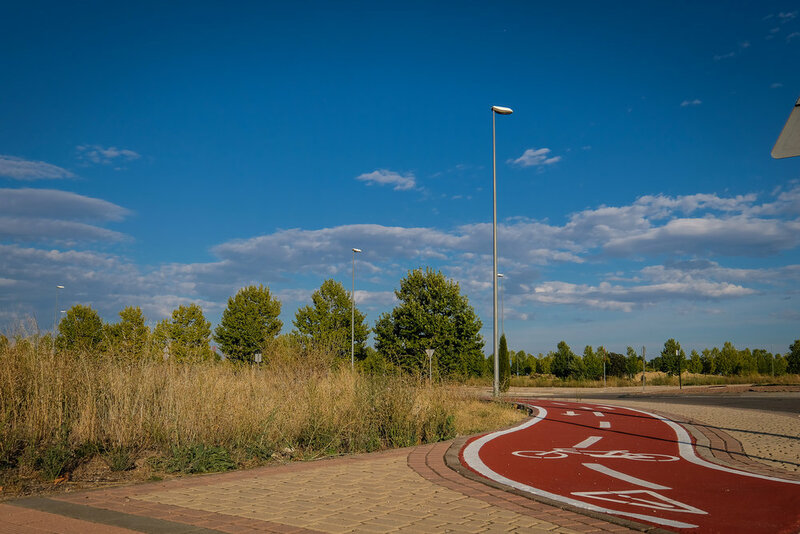 "Cuida Valdeluz" ("care for Valdeluz"), a play on the town's name "Ciudad Valdeluz"
Dating back to 1997, this project finally welcomed its first residents in 2016. 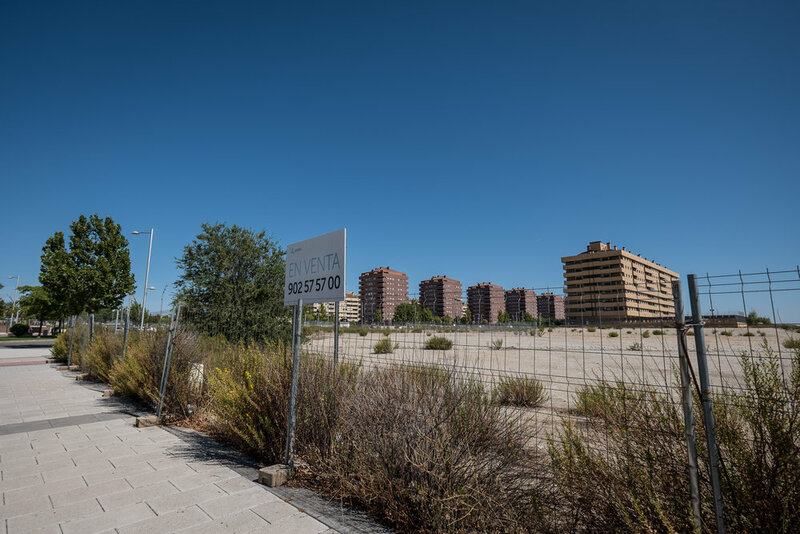 While Seseña and Ciudad Valdeluz seem to have outgrown their ghost town monikers, the grandiose El Cañaveral project appears to be stuck in development purgatory. I visited on a Sunday evening and the town was completely devoid of activity save for a few curious locals leisurely driving around. Entering the development from the highway, I was greeted by a wide boulevard with large blocks of new buildings -- empty and boarded up, no less -- on one side and on the other a row of flimsy shacks selling apartments (using rather exaggerated visuals, if I might add). 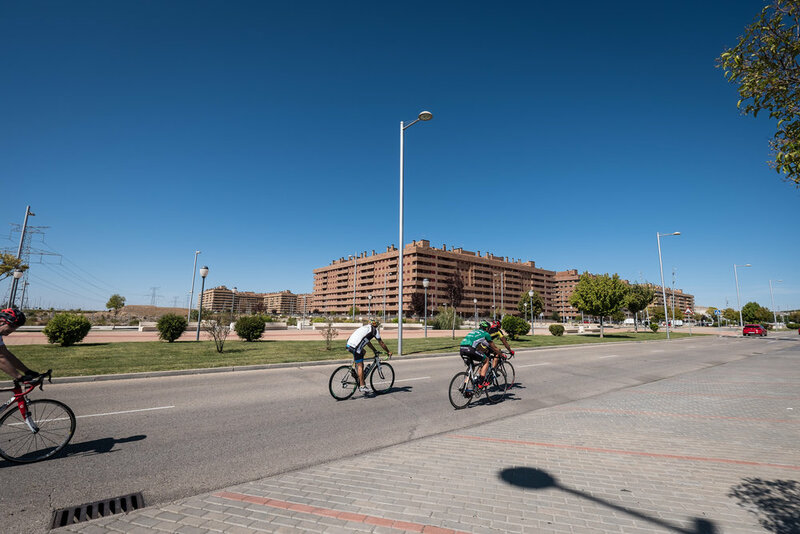 Further into the development, the red brick building stock gave way to a smattering of shiny glass boxes and chain-link fences; very few people live in El Cañaveral now and, unless you find a lone pharmacy to be entertaining, there is not much to do. 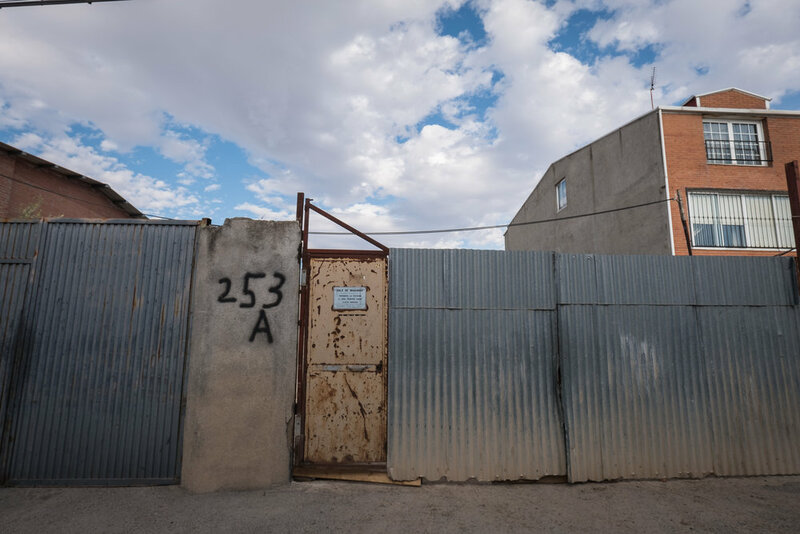 This enclave gets a bad rap (Europe's largest shantytown! ), but it's really just a boring residential street in need of a good paving. Next to the languishing El Cañaveral development is La Cañada Real, and I suspect that this community's reputation as a slum is the result of a smear campaign by greedy developers and control-freak urban planners. This little enclave, which is really just a long, curving road, started off as a route for cattle changing pastures and has morphed into a quiet residential street. 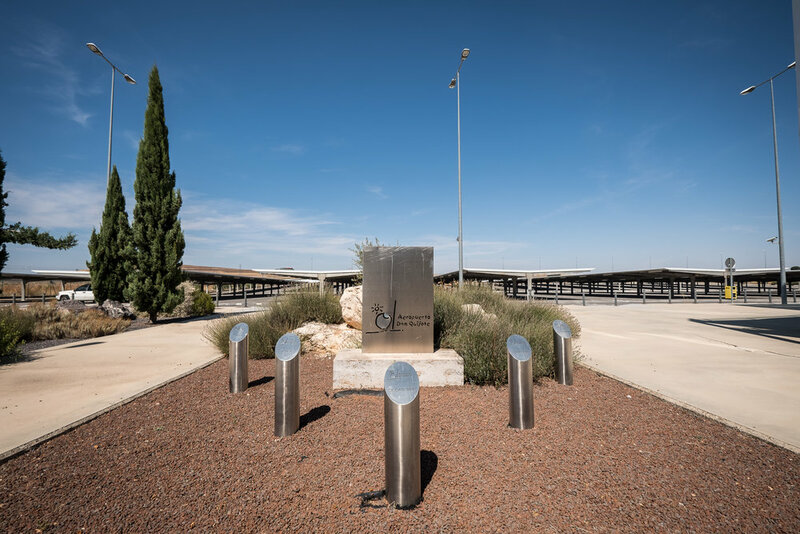 This project is also known as Don Quijote airport, an apt nickname considering that both the airport and literary character cannot distinguish delusion from reality. Spain's building boom didn't stop at residential developments but extended to colossal road and airport projects. 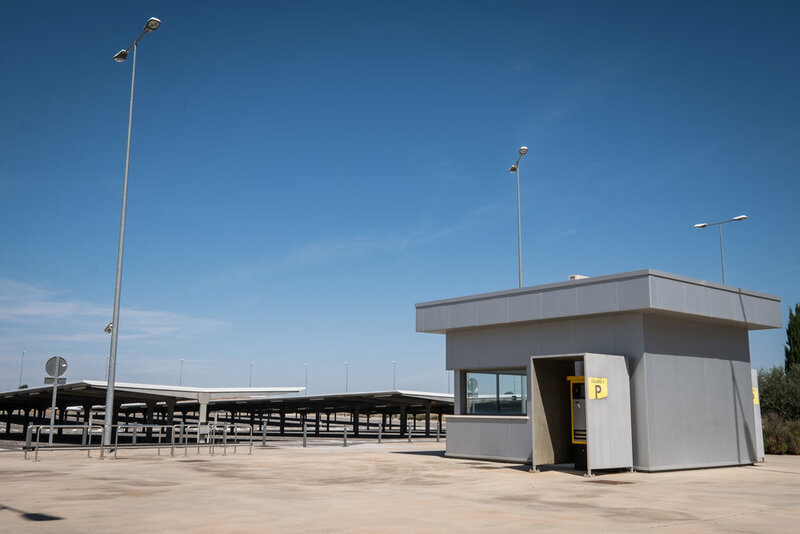 The Ciudad Real airport is the best example of the country's wasteful building practices, and the €1bn project sold in 2015 for a jaw-dropping €10,000. The airport opened in 2008 and closed due to bankruptcy in 2012; the high-speed rail stop to Madrid was never built. 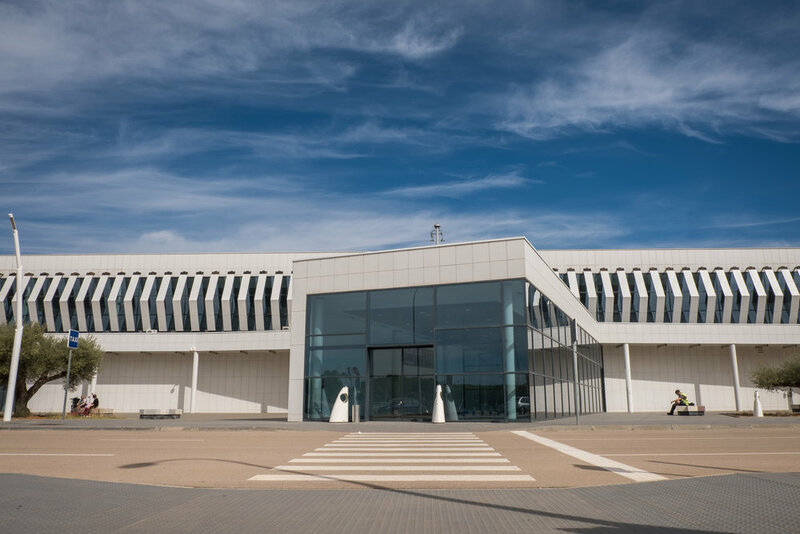 Today, the airport and its nearby copper-clad visitor's center sit empty and tightly-secured. When I visited, I was amused to see a guy rollerblading around the empty streets unimpeded, so at least the airport is getting some use. Walking around the desolate grounds was straight out of Stephen King's The Langoliers, and I couldn't help but press my nose to the dirty glass to get a better look inside the the lifeless terminal. There are security guards at the airport, one of which who wasn't pleased when I ignored the flimsy plastic chain cordoning off an outside stairway to the departure hall upstairs. 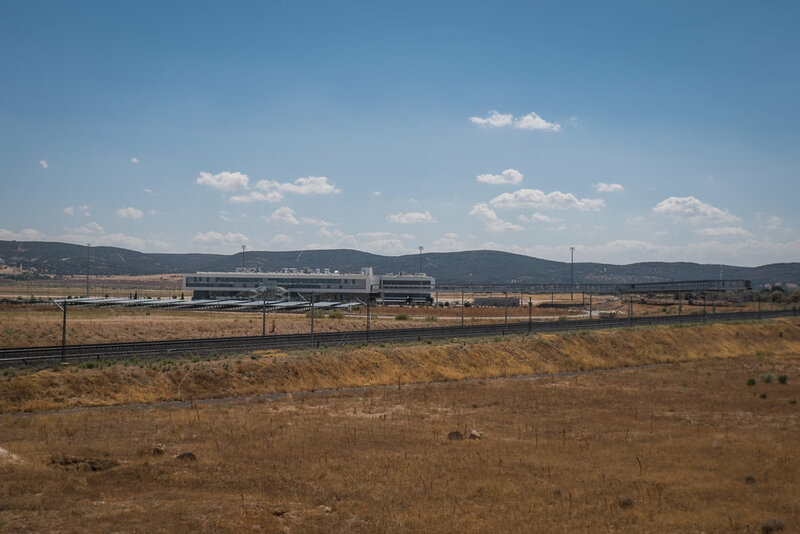 This airport opened to much fanfare in 2011 but has only been offering flights -- one departure and one arrival per day -- since 2016 with no plans for service expansion. 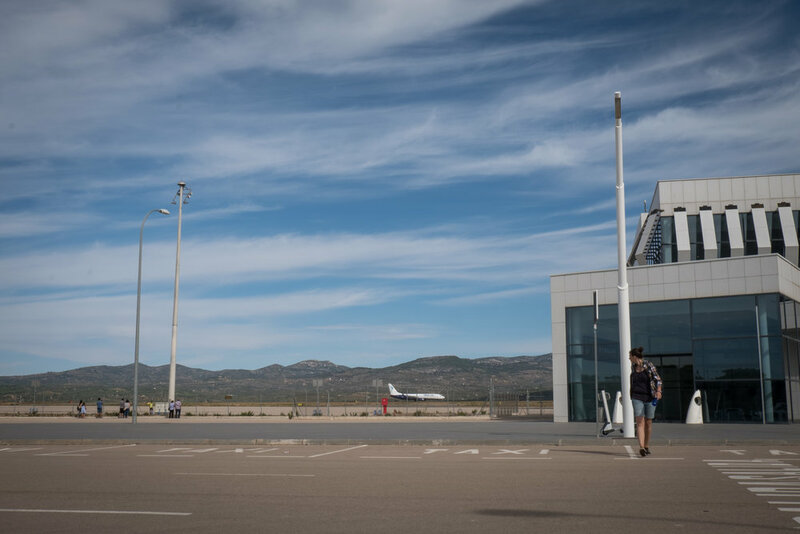 Another bizarre relic of Spain's building boom, the Castellón–Costa Azahar airport is just active enough to stave off irrelevancy. I visited it on a beautiful Friday morning in August, just as the day's solitary departure took off. Inside the empty terminal, an information screen told me that the next flurry of activity wouldn't happen for another ten hours when a flight from Bulgaria was scheduled to arrive. Upstairs, a girl staffing a quiet art gallery looked up from her book as I passed by, making me think how lonely working here must be, or if she ever got visitors. 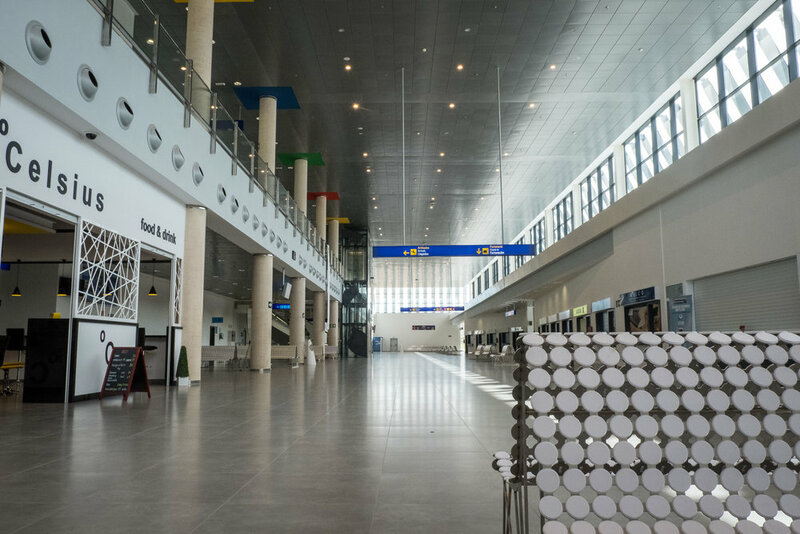 This airport opened in 2011 and was superfluous from the start, as it was built to replace the existing regional airport. 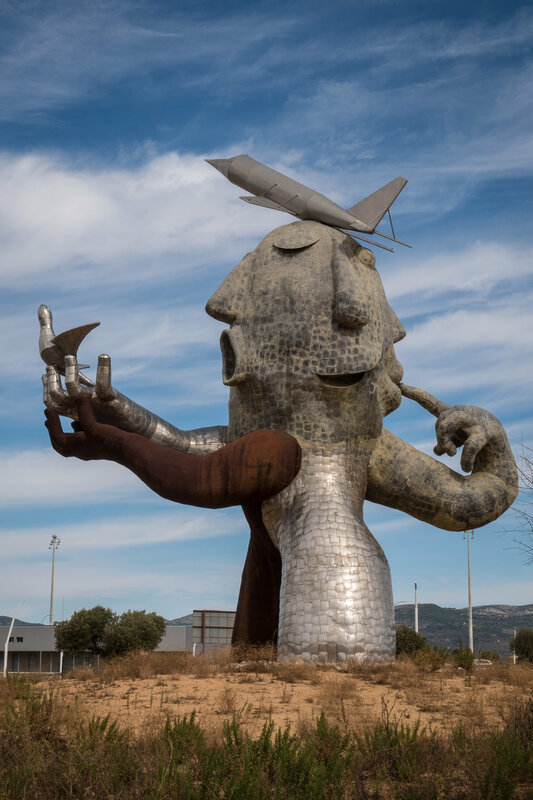 Local politician Carlos Fabra spearheaded the project, enriching himself in the process and commissioning artist Juan Ripolles to create a quirky sculpture in his own image; Fabra is now in prison for tax fraud. 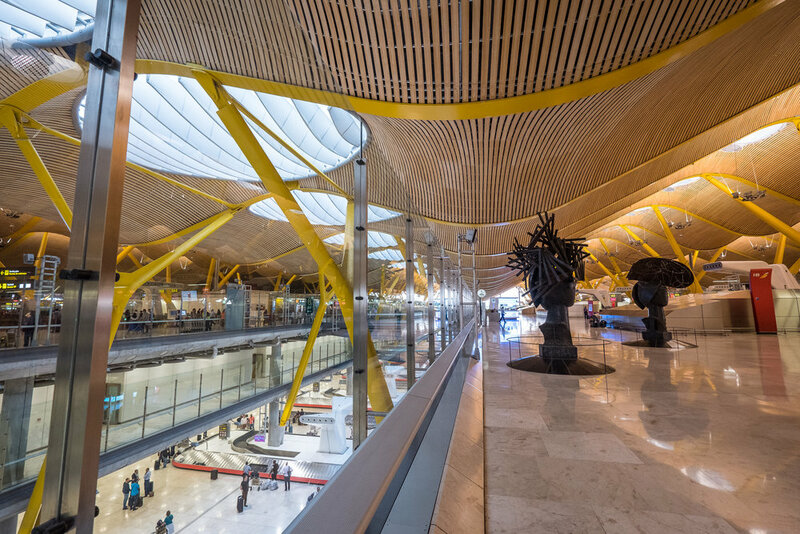 As one of the world's largest airport terminals, this project is a gross representation of Spain's building boom and wasteful building practices. 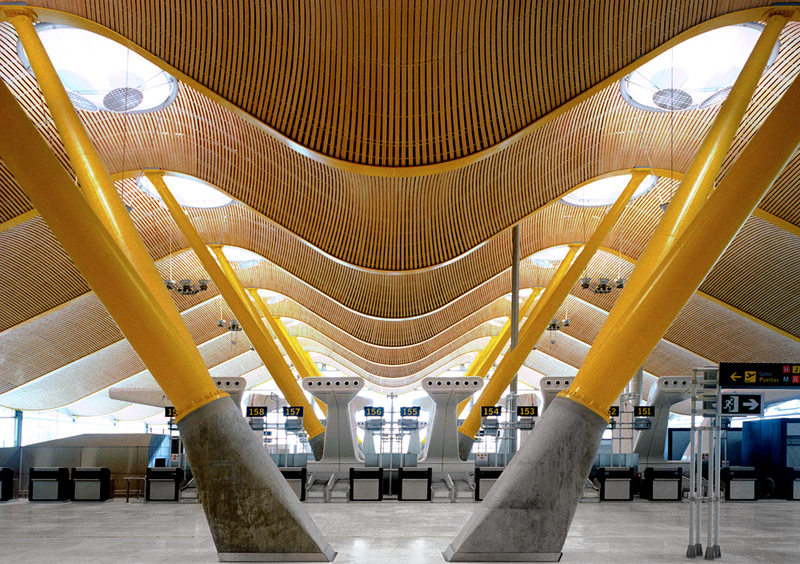 While MAD's T4 project has been largely a success and is well-used, it accurately represents Spain's recent building boom. Construction began on the terminal in 2000 and finished in 2004, although the building didn't come into operation for another two years. T4 is quick to boast that it "is one of the world's largest airport terminals in terms of area, with 760,000 square meters (8,180,572 square feet)" and begging the question, do we really need such large facility? The terminal is gigantic, with so much empty space dedicated to soaring ceilings and counters that seem oceans apart; how much money and resources go into maintaining this huge area? 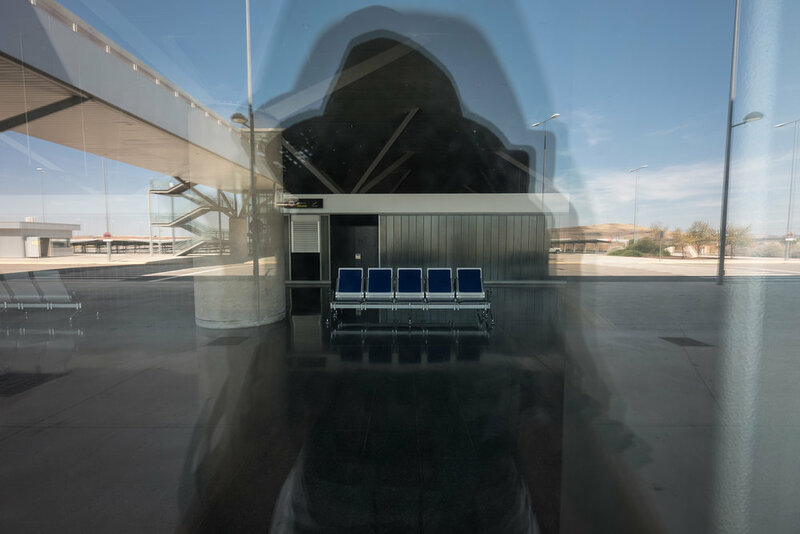 Instead of giving me a "stress-free" start to my journey, I couldn't wait to leave the dimly-lit and cavernous terminal with its creepy architectural details after sitting in it for twelve hours before my flight to Ukraine. Note to self: fly less. is that.... E.T. with angel wings? ?